The Pacific Jazz Institute at Dimitriou’s Jazz Alley presents for one night only the Eleventh Annual Sister City Female Jazz Vocalist Audition. Doors open at5:30 pm, auditions start at 6:30 pm and the evening will end around 9:30pm. The 11th Annual Sister City Female Vocalist Jazz Audition at Jazz Alley is right around the corner so mark your calendars! The Seattle Kobe Sister City Association (SKSCA) is pleased to announce its Seattle-Kobe Female Jazz Vocalist Audition. SKSCA will select one high school and one adult female jazz vocalist from the greater Seattle area to Kobe, Japan to perform at the Kobe Jazz Queen Vocalist Contest on May 9th, 2015. Every fall for the last fifteen years, the winner of the Kobe Jazz Queen Contest has flown to Seattle to debut in the US at Dimitriou’s Jazz Alley. Last year SKSCA sent local jazz vocalist Jennifer Kienzle and high school vocalist Laura Rosok to Kobe for the May 2014 Kobe Jazz Queen Contest. This year, the SKSCA is proud to host its 11th jazz vocalist audition as a reciprocal exchange to send two Seattle female jazz vocalists to Japan. Finalists will be selected by end of February, and they will perform at a live audition at Dimitriou’s Jazz Alley on Monday, March 9, 2015, from 6:30 – 9:30 p.m. (Doors open at 5:30 pm.) Family, friends, and community members are encouraged to come and support the finalists. The suggested donations are $5.00/students and $10.00/adults with proceeds supporting this and future Seattle-Kobe Jazz competitions. Finalists will be announced the first week of March. March 9 – Live audition at Jazz Alley from 6:30p until 9:30p. Sponsors for this event include: Dimitriou’s Jazz Alley, Kobe Trade Information Office, Sankei Travel, Seattle-Kobe Sister City Association, and Shinkaichi Music Street. Jazz at Lincoln Center released the finalists for the 2015 Essentially Ellington concert and three local schools again made the list. Essentially Ellington will take place May 7-9 in New York City. During the set break at Phil Sparks’ weekly Friday gig at The Latona Pub, the video for Thomas Marriott’s The Tale of Debauchery debuted. It was a full house of friends and jazz fans. The video has now been posted to YouTube … so take a look! 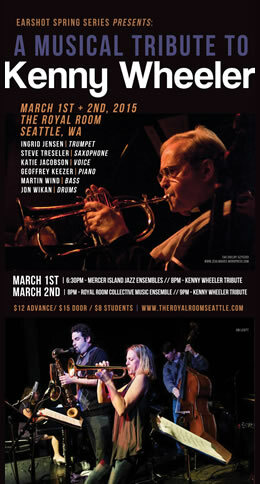 Steve Treseler and Ingrid Jensen are co-leading a project in honor of the great trumpeter and composer Kenny Wheeler who passed away last year. The all-star band features Geoffrey Keezer on piano, Martin Wind on bass, Jon Wikan on drums, and vocalist Katie Jacobson. They will be playing at The Royal Room on Sunday, March 1 and Monday, March 2 as part of the Earshot Spring Series. The always-amazing Portland Jazz Festival kicks off tomorrow, Tuesday, February 17 and runs through March 1. Festival headliners include: Bebel Gilberto, Kurt Elling, Taylor Eigsti, Vijay Iyer Trio, Christian McBride Trio, Lou Donaldson Quartet, Bill Charlap Trio, Lee Konitz Quartet, Nicholas Payton Trio, Billy Childs’ Map To The Treasure, Hal Galper Trio, Julian Lage Trio and more. Quiet Please Recording and Buddhist Thug Productions teamed up with trumpeter Thomas Marriott to produce a music video promoting Marriott’s most recent album “Urban Folklore”. The song featured in the video is called “The Tale of Debauchery”. The video, whci was produced by videographer Matt Byrne and recording engineer John Metzler, will be available online after Friday’s premier … but you should come down and see it live and hear some great music! Scott Wendholt at Tula’s – Tonight! NYC trumpeter Scott Wendholt, whose credits include The Vanguard Orchestra, Maria Schneiderʼs Big Band, Vincent Herring Quintet and more, will perform at Tula’s Jazz Club on Friday, February 6. Wendholt will be backed by John Hansen (trumpet), Chuck Kistler (bass) and Greg Williamson (drums). 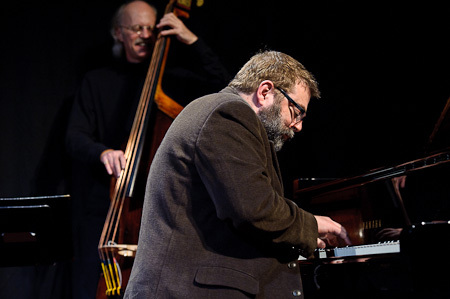 Jazz Northwest samples the ever-changing jazz scene from Portland to Vancouver BC, with the latest jazz CDs and news about where to hear live music around the region. This week’s show includes new releases from Portland bassist David Friesen, Seattle singer Reggie Goings and news about upcoming performances by Gregg Williamson’s Big Bad Groove Society, Eugenie Jones, the Dave Peck Trio, and Collier and Dean with samples of each. 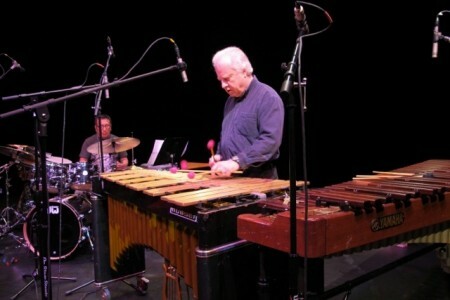 Jazz Northwest airs Sundays at 2 PM Pacific and is produced by Jim Wilke, exclusively for 88.5 KPLU and kplu.org. The program is also available as a streaming podcast after the broadcast. Geoffrey Keezer and Seamus Blake are traveling through the Northwest. Tonight they are performing at Boxley’s in North Bend and Wednesday night they’ll be performing at the Whatcom Jazz Music Arts Center in Bellingham. Check out the video above from their performance in Tacoma the other night. of a solo performance by Dave, of My Funny Valentine, sent to your email. To Friday night’s performance (2/13/14) sponsored by KPLU!